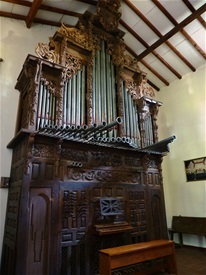 Francis Chapelet is very interested in the Spanish organs; he brought back an 18th century example which had been salvaged by an organ-builder in a nuns'monastery in Galicia. 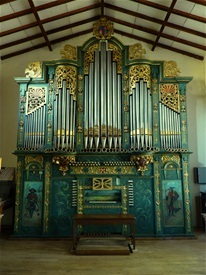 He had it fitted up in the auditorium which he had built on his parent's estate. The case was painted by Francis and his father for it had never been painted since it was built. One Keyboard with 45 notes and brocken octave. Stops cut in Bass and Treble on c'# - Little pedal with 9 keys in permanent pull down pedal. The case dating from 1736 is made of very well worked pine wood which ha never been painted. Pedal coupler Great - Tremulant - Shift coupler I/II - suspended action for Great and sticker action for the Récit in the lower case. A 440 - Temperament lightly unequal. 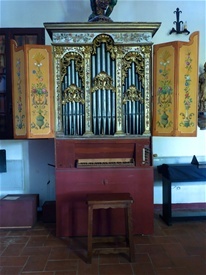 F.Chapelet brought it back to Montpon and so increased his collection of historical organs to 3. One keyboard with 45 notes - Brocken octave - Mechanical suspended action with a little rollerframe.